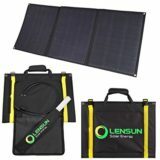 Specifically designed for mobile use, not prone to shading or angling issues. 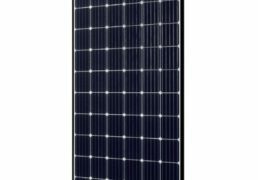 The PowerFlex RV Solar Kit typically provides more amp hours per day than conventional crystalline solar panels. 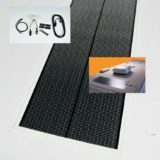 Using an adhesive based mounting system the kit eliminates the need to penetrate your RV’s roof and has an extremely low profile. 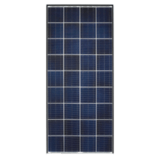 The most efficient thin film RV Solar Panel on the market. Fulfills HR1424 Tax Credit Qualification for RVs – Deduct 30% off the cost of a system as a tax credit. Make sure you contact your tax adviser. 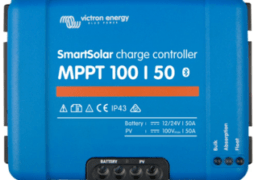 5 year limited warranty – best in the industry! Low weight enables them to be shipped inexpensively . Made in the USA in Arizona! 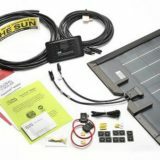 The PowerFlex RV Solar Kit is a complete system solution and contains all the necessary parts for you to start collecting the suns energy today! 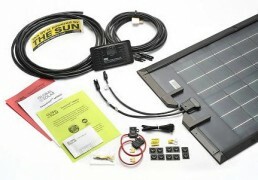 Kits include 1-2 100 watt American made RV Solar Panels, charge controller, non-penetrating mounting hardware, 30 feet of interconnect wiring, and installation instructions. 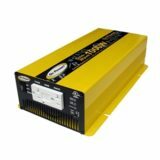 With a PowerFlex RV Solar kit you can go farther and power all of your gadgets without the need for costly hook ups or noisy generators!